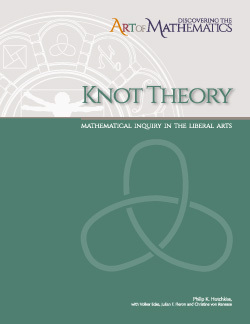 The teacher edition for the Knot Theory book will be ready soon. Discovering the Art of Knot Theory lets you, the explorer, investigate the mathematical concepts and ideas of knot theory using Tangles®. While exploring the mathematical properties of Tangles® you will find connections to popular commuter games and an unsolved problem worth a million dollars. Using the Dowker notation and combinatorial reasoning you will explore the mathematics of the human knot game and the (knotty) problem of knot enumeration. You will explore various ways mathematicians have invented to distinguish knots such as tricolorability, and the unknotting number of a knot.